For Sydney property buyers who’ve made their mark in residential investment, there are a few “next paths” that can be forged. You can take a meandering walk towards multi-residential holdings like duplexes, triplexes or flats buildings. You might imagine these cash cows will have you bathing in $100 bills, but be prepared for higher running and maintenance costs as well as the compounded tenant challenges. You could dabble in small development projects – splitter blocks, strata titling or renovations. All can be lucrative, but are intensive and often risky for the solo first-timer. There is another option that has a mountain of upside, but the lack of understanding surrounding the sector can cause even seasoned investors to quaver like beached jellyfish –commercial property. 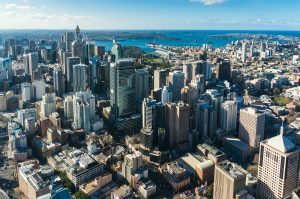 There’s rarely been a better time to add a commercial holding to your dream Sydney portfolio. Commercial property can cover many of the bases residential holdings don’t – and all while generating a great income with low maintenance and a solid tenant that often settle in for years, even decades. This all sounds impressive but how do you graduate into this seemingly untapped world of stunning income and growth? There are three broad first-time investment types in the commercial realm. There’s industrial property where you may find a small, strata titled shed just right for a business tenant such as a mechanic or textile producer. There’s retail property such as shopfronts where you might score a boutique fashion outlet or homewares distributor as a tenant. Then there are strata offices which suit any business looking to set up professional services in a broad range of industries. In the current Sydney real estate climate, this last option offers the best opportunity to move into the big-time world of commercial holdings in my opinion. Office space, particularly in the inner-metro areas of our capital, provides first timer buyers with a wealth of advantages. First up, there are a broad range of businesses looking for just this type of space, which reduces the letting risk. Secondly, if you’ve been struggling with gross residential returns of two to three percent this year, here’s some good news - small strata offices within 20km of CBD are achieving five to seven per cent yields at present – net! The buy in is great too. You can acquire a small office for as little as $150,000 in our CBD – that’s about a tenth of the median house price for the most affordable suburb within 10km of the CBD. That said, our advice is to seriously consider stepping it up with 50 to 70sqm spaces for between $400,000 to $1,000,000. The age-old trade-off has always been between capital growth and cash flow, but here’s another factoid for the starter landlord. Some suburbs are seeing a huge chunk of their office space being converted to residential by developers. These addresses are finding their office sector supply dwindling and that has resulted in value gains – and I’m not talking small fry. In North Sydney for example, particularly in locations close to the metro line, offices have seen 80 per cent capital gains in the last five years. That’s not too shabby for a high cash flow purchase. The Inner West, Inner East, Lower North Shore and Northern Suburbs regions are also providing buyers with some terrific options at present. A great example of great investment property would be one we recently purchased in Gladesville. Two adjoining retail suites in a brand-new development were purchased for a total price of $1.8m despite the vendor seeking over $2m. The suites could be leased for around $110,000pa net + GST, providing a net yield of over 6%. Happy days! In reality, this is all just the pointy end of the iceberg, but the commercial sector requires serious due diligence. You need to understand valuation techniques, the potential and the lease terms. A commercial property purchase isn’t beyond the scope of most intelligent investor skillsets, but understanding the field takes time, and the learning curve is steep. Here’s an opportunity for you to leverage off a specialist commercial buyers’ agent to your advantage. It’s a sector where experience, contacts and knowledge will result in reduced risk and better returns – both cash flow and capital growth. Professional know-how pays dividends and should allay the fears of novice commercial investors.